Ian Carmichael, Tommy Steele, Benny Hill et al. 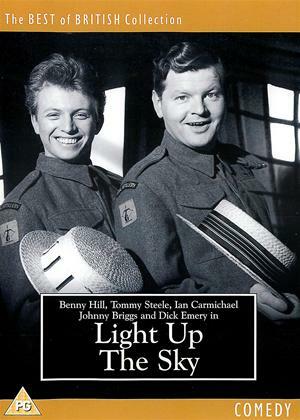 Lewis Gilbert's classic comedy drama portrays the antics of a British Army Searchlight Squad during World War II. Lieutenant Ogelby (Ian Carmichael) has his work cut out to keep his 'legionaires' at their post and not rampaging through the local countryside. The McGaffey brothers (Benny Hill and Tommy Steele) create havoc with their light-fingers and light-loving with the local girls, whilst Smithy (Johnny Briggs) pines for his sweetheart. The Searchlight Squad is a rag-tag band of men brought together by the war, who must now learn how to live and fight together in order to survive. As the Nazis continue their bombing raids, Lance Tomlinson has to tread a fine line between upholding the army's discipline and remaining one of the boys.